Look elegant and beautiful in this Cleopatra Costume. Sheath dress with double front slits, collar and cuffs with gems, belt with gems, and headpiece. Fits sizes 4-14. 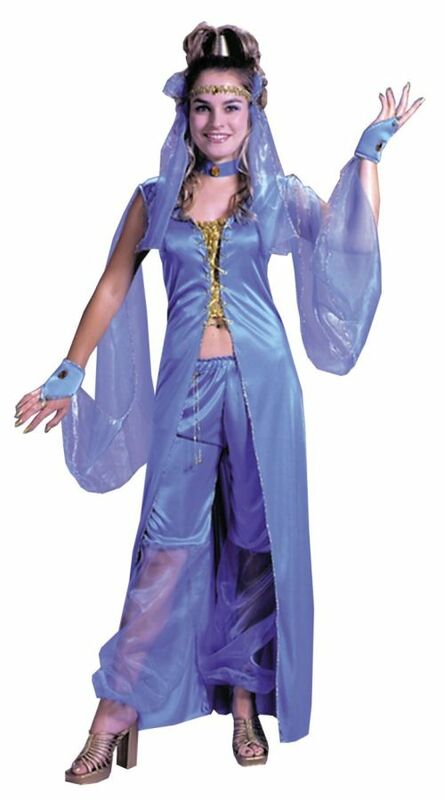 Stop dreaming and start wearing this Dreamy Genie costume. Full length vest with arm veils and jeweled cuffs, capri style pantaloons with gossamer legs, belly chain, headpiece, and choker. Fits sizes 4-14. A costume so authentic all you need now is a camel! Headpiece, under-robe and robe. Shoes and sword not included. One size fits up to size 42. Striped polyester-blend robe with Arabian headpiece and rope belt. Fits most men with chest size 40” to 44”. Costume includes headband with attached veil, crop top, and pantaloons. Women’s standard fits up to size 12.